The pointers on my altimeter are very jumpy and stick sometimes. The altimeter is exposed to the outside atmosphere. This includes all of the dirt and dust present in that atmosphere. Dirt and dust will get into the gears and cause them to stick and bind, the vibration from the aircraft will help the gears to overcome this problem but they will be very jumpy and become worse as the unit gets older. This unit needs an overhaul. Can I convert my milli-bar altimeter to InHg or vice versa? Yes, altimeter dials can be converted, provided that the manufacturer has published a procedure for doing so. If there are no published, FAA Approved, procedures then, no, this modification cannot be accomplished. How often does my altimeter need to be calibrated? The FAA requires that the aircraft static system be tested and certified biannually. The altimeter is a part of that system. The altimeter ID plate says that it is a 35,000 Ft. altimeter, but the repair shop that overhauled my altimeter marked the unit as being certified to 30,000 Ft. Why the difference? As altimeters get older and the parts wear the unit will become inaccurate at the higher end of its range. This does not mean that the altimeter can no longer be used; it just has to be used at the lower altitude. Therefore, it will be sold only to customers who request a lower altitude unit, typically general aviation. What is a “car” altimeter? Sometimes, if a unit is so old and worn that it can no longer be used in an aircraft then these units are sold at a discounted price for use in other than aircraft, typically people will use them in motor homes, cars, and boats. Along with my altimeter, I received a correction card. What is that? Altitude is a non-linear function. It is impossible to calibrate an altimeter to be absolutely accurate at all altitudes. Therefore, a certain amount of error is allowable. The correction card advises the users of the amount of error in a particular altimeter. As each altimeter will have its own characteristics, the error card is identified with the unit’s serial number. TSO stands for Technical Standard Order. This is an FAA document, which defines how a specific type of instrument should work in order to be considered airworthy. Altimeters manufactured by the following companies typically are manufactured to TSO standards: United Instruments, Kollsman, Garwin, and Aerosonic. Altimeters manufactured by the following companies typically are not qualified to TSO specifications:UMA & Falcon. If an instrument is certified to a TSO, it must state such on the ID plate. If it does not state the TSO on the nameplate then you must assume that it is not qualified to the TSO. What are the typical failure modes of an altimeter? In its purest form, an altimeter is simply an absolute pressure gauge. This means that it is displaying the pressure being exerted by the atmosphere at its current location. The earth is surrounded by an atmosphere. This atmosphere is the air that we breathe. The atmosphere is held in place by the earth’s gravity. The atmosphere has a specific weight. The weight of the atmosphere is approximately 14 pounds of weight for every square inch of earth when measured at sea level on an average day. An accurate method of measuring this weight is to use a barometer. A barometer is a reservoir filled with mercury. The reservoir has two openings; one opening is exposed to the atmosphere and the other empties into a glass tube. The atmosphere pushes down on the mercury within the reservoir causing the mercury to fill up the glass tube. How far the mercury goes up into the glass tube is directly proportional to the weight of the atmosphere pushing it. This is why barometric pressure is normally expressed in terms of “Inches of Mercury (InHg)”. At sea level, on an average day, the barometric pressure is 29.92 InHg. However, this will vary constantly depending on the weather. Stormy weather tends to pull the atmosphere away from the earth’s surface causing lower pressure. Hot, dry weather pushes the atmosphere down causing higher pressure. The weight of the atmosphere also changes depending on altitude. The closer to sea level that you are, the more air there will be, consequently the atmosphere will weigh more. As you go higher in altitude, the less dense the atmosphere will be, therefore less weight or pressure is exerted. An altimeter measures this change in atmospheric weight as expressed in terms of pressure or feet of altitude. The altimeter provides the basic function of indicating to the pilot the altitude of the aircraft above mean (average) sea level (MSL). The indicator is normally a 31/8” size dial face with multiple pointers or a combination of pointers and counter drum. Location of this indicator is typically in the top row of instruments near the center of the instrument panel. 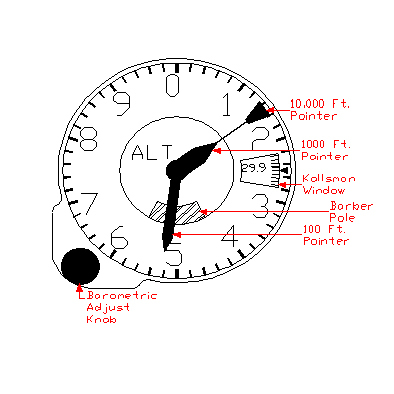 In a standard “T” configuration panel the altimeter is just to the right of the attitude gyroscope. –1000 Ft. to +20,000 Ft.
–1000 Ft. to +35,000 Ft.
–1000 Ft. to +50,000 Ft.
–1000 Ft. to +80,000 Ft. Most general aviation altimeters will fall into the first two ranges. Ranges above 35,000 Ft. are typically corporate jets, commercial aircraft, and military aircraft. The three-pointer altimeter is the most common type of instrument used in general aviation. It is named as such because it utilizes three pointers in order to display the current altitude. One pointer is used to display 100 Ft. increments. A second pointer is used to display 1000 Ft. increments and the third pointer displays 10,000 Ft. increments. The Technical Information Section of this document provides instructions on how to properly read a three-pointer altimeter. The counter-drum altimeter is named as such because it displays altitude utilizing a single pointer and a rotating drum that displays digits. The drum displays ten thousand and one thousand foot increments. The pointer displays from 0 to 999 feet. An encoding altimeter can be of either the three-pointer or counter drum type of altimeter with an encoding module built into it. The encoding module takes the altitude information and converts that data into a digital code. This code is then sent via a set of wires to the aircraft transponder. A transponder is a radio device that reports the aircraft altitude to ground control radar. The blind encoder is a very special type of altimeter. This unit has no dial or read out that is visible to the user. It has only an electronic output to the aircraft transponder. The use of a standard altimeter in conjunction with a blind encoder is often more economical than purchasing an encoding altimeter.